So, Fuzz, how did you get the nickname ‘Fuzz’? When I was 6 or 7 at school, a couple of girls in my class liked my fuzzy hair, so they called me Fuzzy, and it’s stayed with me! I bought a Ford Anglia at 15, but scrapped it before I could drive, then I drove my mum’s Fiesta Mk 1, but the first car I bought of my own to drive was a 1950’s series 1 Land Rover. I did also buy a double-decker bus! But I didn’t drive this, I got offered some money for it so I sold it so I could party for the summer! What’s your favourite classic car? I’m a big fan of 1920’s & 30’s cars like a 1930’s Lagonda, and Austin 12s, Austin 30s. I like a car that’s about the journey. Where you think about what you’re going to take and even a 50 mile trip can be an adventure. I love an adventure. Do you prefer driving or fixing cars? I think driving, as if I’m driving I’m probably on a break somewhere! But I do like fixing them as well. I like the puzzle that classic cars offer; figuring out why things aren’t working. Like with my Jensen I’m rebuilding, it starts up & ticks over but it’s not good in the mid-rev range. Eventually, I’ll find out why and fix it. I think it’s having a passion for a car, especially a slightly unreasonable passion! If you’re spending a lot of time on looking after it & doing it up as a hobby, then essentially it’s become a classic. Some cars are classics straight away, like modern Alfa 4Cs or Alfa 8Cs and arguably a new Porsche 911. These sort of cars get regarded as classics much faster than modern saloons for example. Any car can gain classic status; they just gain it at different rates. I think the last cars accepted as classic now were cars like Morris Marinas or Austin Allegros. Even modern saloons can become classics when you start to think “I don’t see those anymore”. A lot of cars have clubs dedicated to them, including the modern ones. There’s even a Ford Mondeo club! These clubs are great as one day there won’t be parts for these from main suppliers, so they’ll become a good source of parts for doing them up. Which car stands out the most of those you’ve restored? From Car SOS, it’s probably the AC Aceca, a supremely lightweight, precision engineered car that looks like a DB5. I used to have a model one as a little boy but didn’t see a real one until about 10 years ago, so it was pretty special to restore one of those. The Austin 12/4 Clifton Tourer we restored was special too, as it cemented my love of larger pre-war cars. What’s your favourite era of cars? I do like the 1920s & 30s, like I mentioned, but I also like the 1950s GTs too, hard top sports cars from that era. They’re very rakish and fantastic designs. What kind of fixes are the toughest? Ones where it’s hard to get the parts. If we can’t find them, we have to make them, or adapt – for example if there are no panels, we have to make them, it’s as simple as that. The worst thing of all though is getting a car that someone else has had a go at! When they’ve done it badly, you have to unpick what they’ve done, and try to find a datum point, where to start off from that they haven’t touched. We probably get more people who’ve bought a car & it looks alright, but they can’t work out what’s not quite right, so we have to work out what’s happened. Some may have had a big smash at some point, and there are ripples under the body, so the doors don’t quite shut properly, that kind of thing. How did you get into car repairs? When I was younger I used to go up to my cousin’s house in Linlithgow in the school holidays, and he had a garage where I used to help out, sweeping up, making tea, watching out for fires on welding jobs, that kind of thing. Then I started my apprenticeship on the buses after leaving school. I think my interest has always been there. What gives you most satisfaction, working on a car or playing in your band? Well, they’re two entirely different things. I love working on my own car and I love playing in a band. If I’m working on someone else’s car then I’d probably rather be playing in the band! It’s great being in the band; you get lovely people jumping up and down in front of you having a good time, and free beer – it’s just a good laugh isn’t it. We used to do gigs with bands like Placebo, and I played Glastonbury last week with The Beat and had a brilliant time. Do you like any current bands? I listen to 6 Music a lot, so I’ll pick up on new stuff and download stuff I like. To be fair there’s still so much from the past you can always discover new bands you may have missed, there are so many bands about. Everyone’s made at least one interesting track at some point I think. It’s a bit like with cars; I like some modern cars too – I appreciate them, they’re good, but I do prefer the older stuff. In your series Car SOS, which have been your most surprising cars? I think it’s got to be the Mercedes 230SL Pagoda we did in series 5 which was the most hideously repaired car I’ve ever seen. We had to remove the outer 8 inches of it because it’d been so badly repaired. It had been repaired using an arc welder. It looked like a cow had fixed it with a knife and fork! We had to undo a huge amount of stuff which took a couple of thousand hours. When we find something that’s been lost by someone, like an old shopping list, a note or a coin left in a car, they all have a little story. I like stuff like that. In general, it’s always nice when a car starts up after many years, or comes out of the paint shop all done up like new. It’s transformed! Have you ever considered walking away from a car in Car SOS? Yes, in series 1, a Ford Anglia, I realised it wasn’t going to be able to be done in the timescale, not safely anyway. We gave them their car back and fixed up another Ford Anglia for them instead. We do go out and check out a lot of cars beforehand and do turn down a few. How do you & Tim cope with the emotions of the owners when you reveal the restored car? It’s when watching it back really that it hits you. During the experience, we’re concentrating on getting the shots and dialogue, and making sure the car is ready, so we’re too immersed in that at the time. 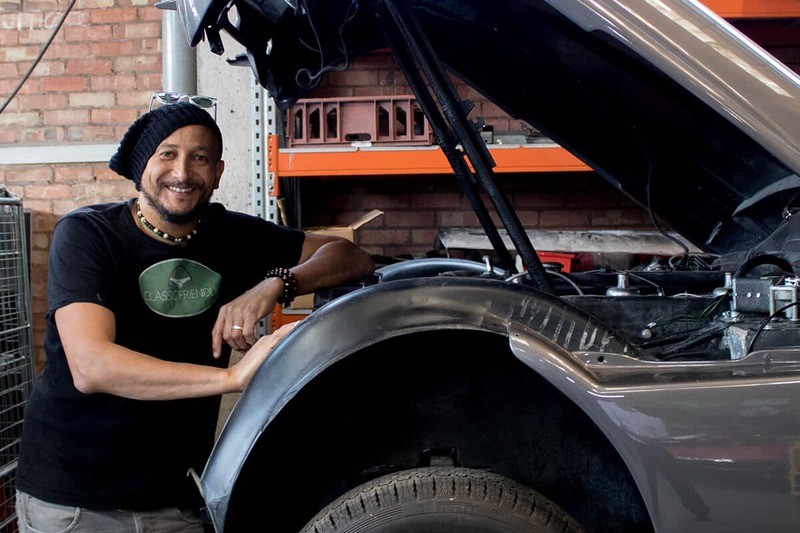 What do you put the success of car SOS down to? I put it down to it not really being a car show. It’s more about how great people can be, and how other people can appreciate that, with a little bit about a car attached to it. It’s mostly just about how good people can be to each other. I think it’s great that The Parts Alliance manages to keep stock for older vehicles too. It’s great they have the foresight to do this. It takes space and time, with cataloguing and storage. And going forward, I’d implore anyone in the motor industry to look to the future, try to archive things. We just need a couple of massive hangars full of shelves!